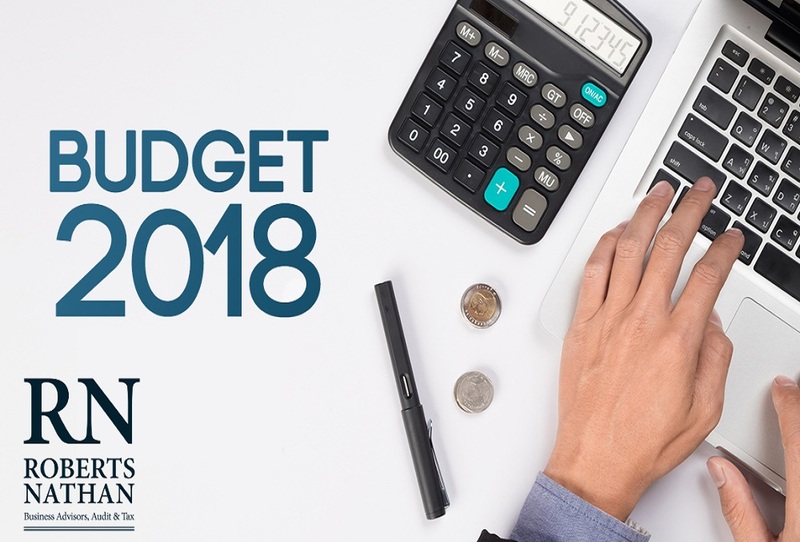 Welcome to Roberts Nathan’s 2018 Budget highlights, we’ve poured through what we felt was the Minister’s largely underwhelming budget to find the Top 10 Highlights for individuals and businesses. On Tuesday the 10th October 2017, Minister Paschal O ‘Donoghue delivered his Budget speech for 2018. He did so with a backdrop of 4.3% growth in the economy in 2017 and further expected growth of 3.5% in 2018, as well as 17 consecutive quarters of continued employment growth. In spite of the positive news and because of the largely unknown effect of Brexit, as well Ireland’s high level of sovereign debt, the budget provided only modest tax saving for low to middle income earners. Standard Rate Cut-Off Increase of €750, meaning a single individual can now earn up €34,550 at the standard 20% tax rate, and a married couple (with one salary) can earn up to €43,500 at the 20% rate. Giving taxpayers an annual tax saving of €150. Earned Income Tax Credit was increased to €1,150 from €950 in 2016, further reducing the disparity between the self-employed/business owners and the employed. Home Carer Tax Credit (which applies to married couples or civil partners where one spouse or civil partner works in the home caring for a dependent person) increasing from €1,100 to €1,200 for 2018. Home carer’s income threshold to remain unchanged at €7,200. No change to the entry point of €13,000. Probably the most contentious measure introduced was the three-fold increase in Stamp Duty on commercial property from 2% – 6% with effect from midnight on the 10th October 2017. However, the reduced rate of 1% stamp duty will continue to apply on certain inter-family transfers of farm land for a further 3 years. An incentive is being introduced to facilitate the use of share-based remuneration by small and medium-sized enterprises (SMEs) to attract key employees. Gains arising to employees on the exercise of KEEP share options will be liable to Capital Gains Tax (33%) on disposal of the shares, in place of the current liability to income tax, Universal Social Charge (USC) and Pay Related Social Insurance (PRSI) on exercise (approximately 52%). This incentive will be available for qualifying share options granted between 1 January 2018 and 31 December 2023. A new, time-limited tax deduction for pre-letting expenses is being introduced to encourage owners of vacant residential property to bring such property into the rental market for a minimum period of 4 years. The property must have been vacant for at least 12 months to qualify. A cap on allowable expenses of €5,000 per property will apply. This relief will be available for qualifying expenses incurred up to the end of 2021. It will be subject to claw back if the property is withdrawn from the rental market within 4 years. The Minister made the welcome announcement for landowners, that the leasing or agricultural land for the use of solar panels will qualify as agricultural activity for the purposes of Agricultural relief (CAT) and Retirement Relief (CGT). The total area of land used for solar panels cannot exceed 50% of the total holding. Finance Act 2012 brought into force the 7 year CGT exemption for land and purchased between 1st January 2012 and 31st December 2014. To qualify for the relief, the purchaser had to retain the land or building for at least 7 years. This holding period is now being reduced to 4 years. A tax on sugar sweetened drinks is to be introduced in 1st April 2018. The tax will apply to sugar sweetened drinks with a sugar content between 5 grams and 8 grams per 100ml at a rate of 20c per litre. A second rate will apply for drinks with a sugar content of 8 grams or above at 30c per litre. The Corporation Tax rate of 12.5% will be maintained. 9% VAT rate for the Tourism Sector is to be retained. A 0% benefit-in-kind (BIK) rate is being introduced for electric vehicles for a period of 1 year. This will allow for a comprehensive review of benefit in kind on vehicles which will inform decisions for the next Budget. Electricity used in the workplace for charging vehicles will also be exempt from benefit-in-kind. Overall, the 2018 Budget appeared to be a largely underwhelming and has been criticised as a budget that tried to please everyone and ended up pleasing no-one. That being said there are potential tax savings for both individuals and businesses, with effective tax planning. If you’d like to know more on how Budget 2018 can work for you and your business, please do not hesitate to contact one of our tax experts, they’ll be happy to help!